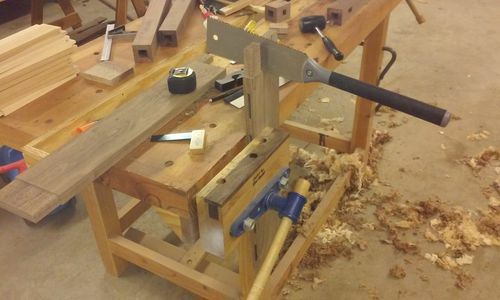 Here I’m going to outline the method I am taking to build myself a Morris Chair. 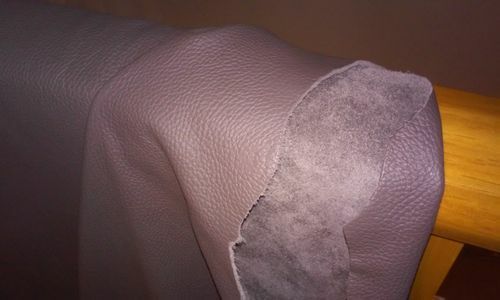 I’ve been wanting to have one of these because I really like the look and the comfort, but also because I want to learn some new techniques, especially upholstery. 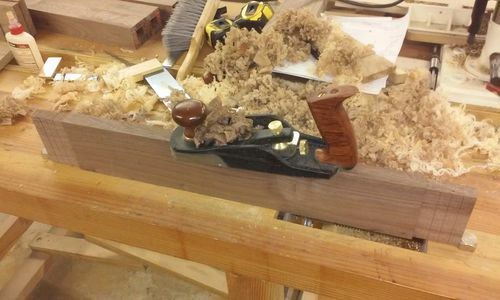 I know there are a number of other blogs on building a Morris Chair, but they are all different, and everyone has their own unique ways of building. So here’s mine! 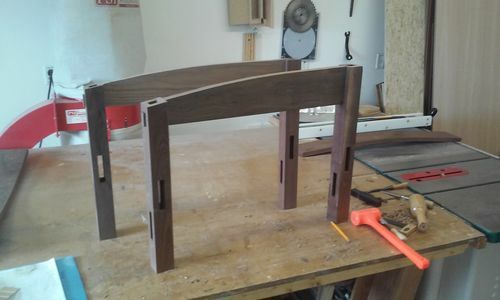 The chair will be built with Walnut and Hickory – one of my favorite wood combinations. I started out by building the legs. 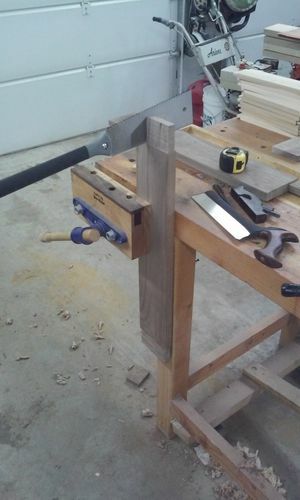 I opted to go with hollow legs, joined together with a lock miter. They look like this once fit together. 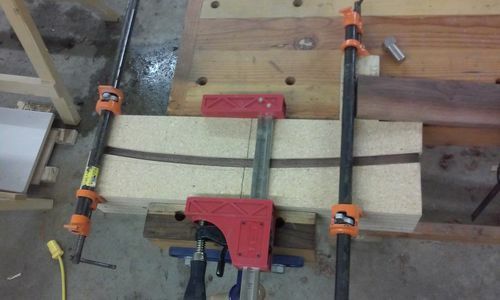 Lock miters are kind of tricky to get adjusted just right on the router table, but once you get it the first time, keep some scrap to help to align the bit the next time you set up. Next I cut out the rails for the sides, front and back. I also mortised them. I smoothed all of the parts after cutting them out in hopes that I won’t have to do much, if any, sanding. 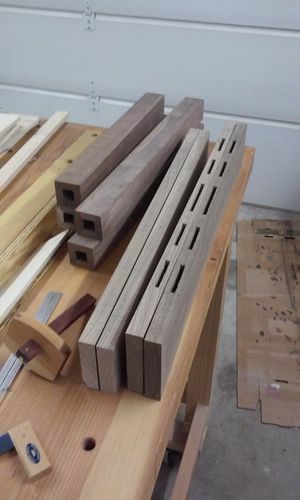 I cut tenons mostly on the table saw, but did use my handsaws to cut some of them down a little. 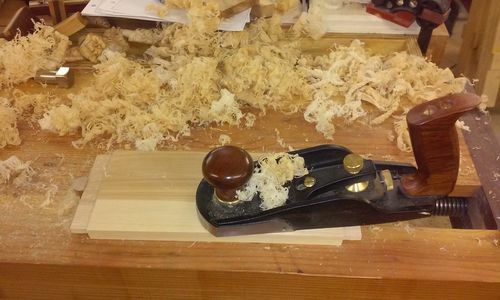 I also used a simple shoulder plane to trim the tenons to fit my mortises. Here’s my steam box, set up and ready to go. I’ve steamed and clamped the arms. Now I’m steaming the stretchers for the chair back. 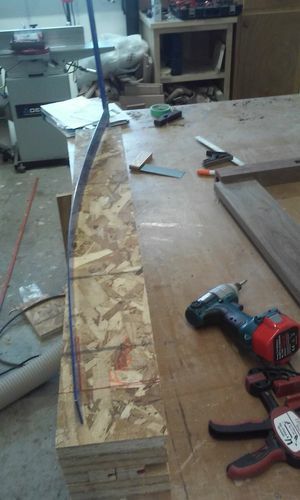 After bending the chair arms, I used them to trace the arc onto the chair sides. 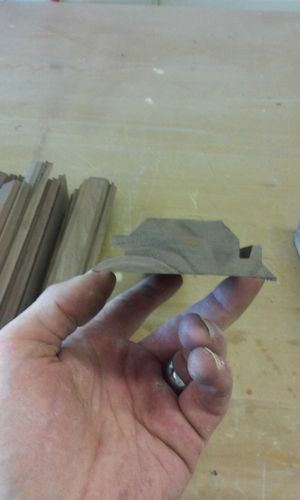 I then cut the arc with the bandsaw. 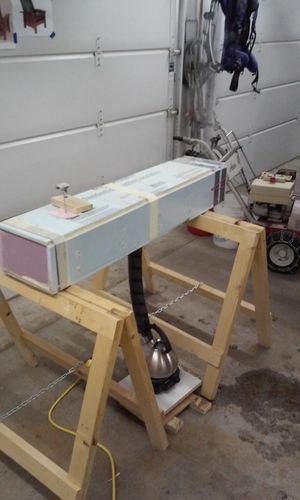 I had the sides partially assembled (dry fit only) so that the arc would be consistent. 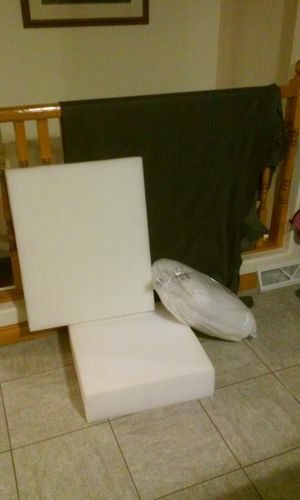 Now I’ve got one chair side completely dry-fit. 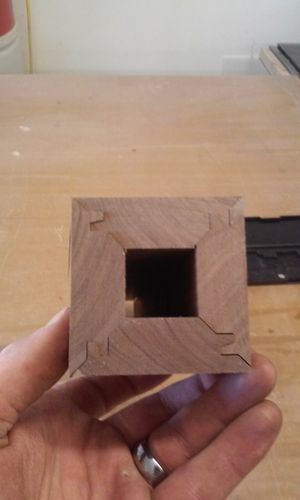 I’ll chamfer the ends of the through mortises so they look nicer. They’ll also get pegged. Ask questions if you like, I know I’m not terribly detailed, and my photography is awful. This is all I’ve got done right now. 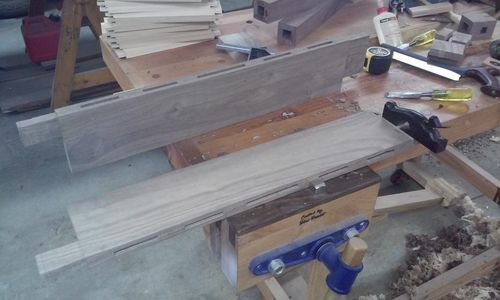 Next post (It’ll take a while – don’t get too excited) will be dyeing the walnut, and making the chair back. 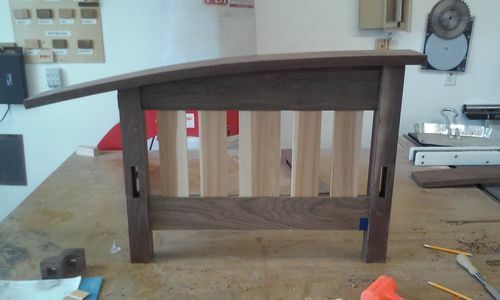 I suppose the last post will be the upholstery and finish. Too early to tell if I’d do things differently. So far I’m happy with the way its turning out. 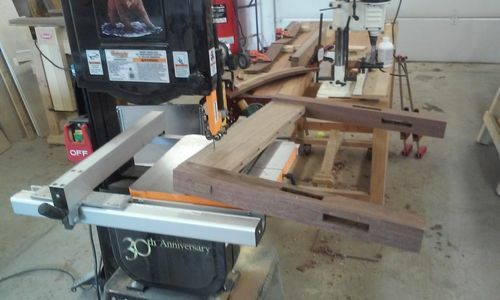 I’ve had a lot of time to plan it all in my mind and perhaps plan it in my supper conversations too (my wife may be getting tired of me talking woodworking). 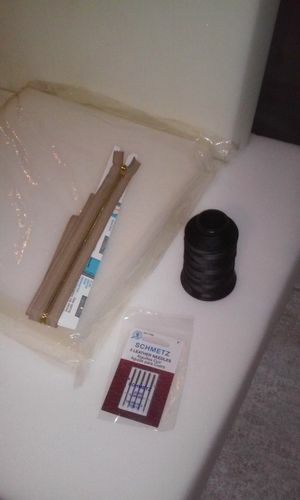 I am using Behlen alcohol based dye, a dark brown. 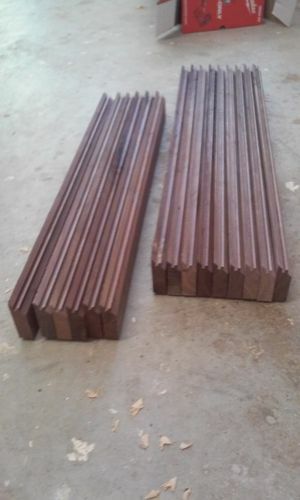 The reason for that is that I have two different varieties of Walnut, and they really don’t match. I’m going to even out the color. One is air dried, the other is kiln dried, and I’m pretty sure one is “American” walnut, and I know the other is Black walnut. I’m using what I’ve got, and adapting! Pete, you have made a great start on this project. 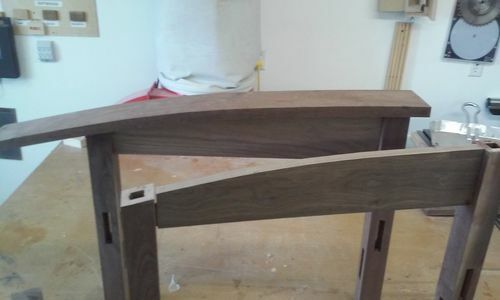 The lock miter legs are spot on, nice job! Pete, great looking chair so far. 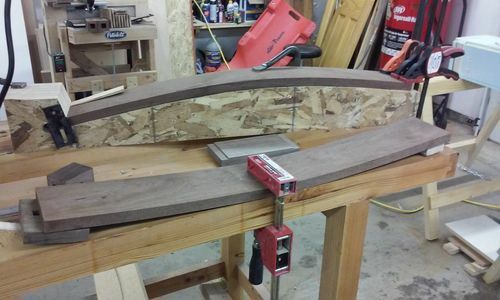 Question: Which walnut did you steam bend (air or kiln dried) and what was its moisture content before bending? 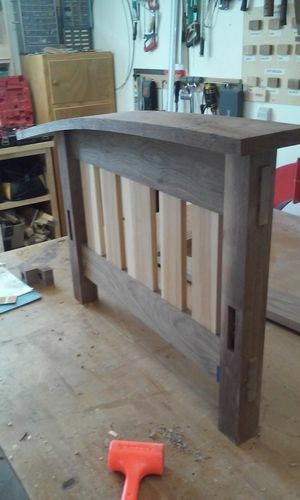 I have had issues bending walnut with moisture content below 7% and am curious. Thanks. 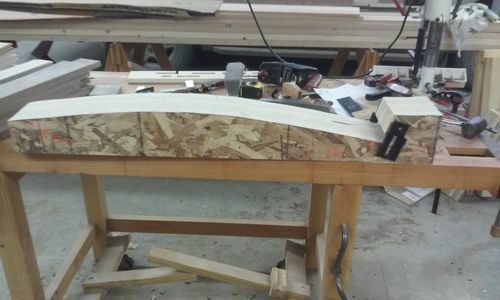 I have had fine luck also with bending kiln dried (hickory), although I’ve never tried any really tight bends. Yes! This is a great blog. Nice progress. 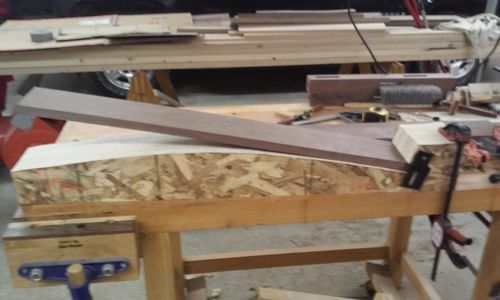 This is a project that every woodworker should build. 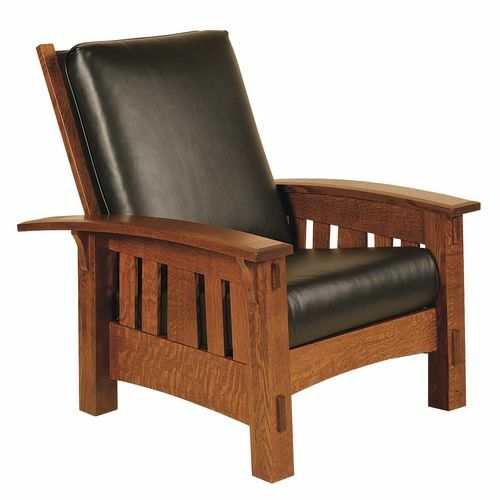 There’s just something about a Morris chair. Thanks guys. It has been really fun so far. Something about learning new things is quite exhilarating to me.